Q: "Migrants carry infectious diseases?" A: (According to research) It was demonstrated that migrants and refugees are likely to have good general health, but they can be at risk of falling sick in transition or whilst staying in receiving countries due to poor living conditions or adjustments in their lifestyle. This is the main conclusion of the first “Report on the health of refugees and migrants” in the WHO European Region, released by WHO/Europe in 2018. The report summarizes the latest available evidence on the health of refugees and migrants– from a review of more than 13 000 documents – as well as the progress made by countries to promote their health. It was developed in partnership with the Italian National Institute for Health, Migration and Poverty (INMP). Refugees and migrants can be more vulnerable to infectious diseases in places or origin, transit and destination because of exposure to infections, lack of access to health care, interrupted care and poor living conditions. 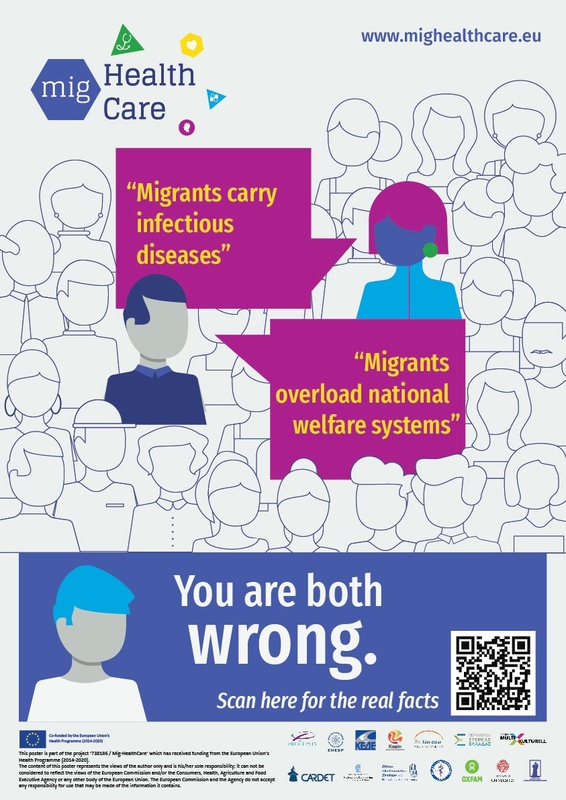 Q: "Migrants overload national welfare systems?" The report “ Cost of exclusion from healthcare – The case of migrants in an irregular situation” published by the European Union Agency for Fundamental Rights (FRA) aims to estimate the economic cost of providing regular access to healthcare for migrants in an irregu¬lar situation, compared with the cost of providing treatment in emergency cases only. Two specific medical condi¬tions – hypertension and prenatal care – were selected as examples, and their associated costs were calculated using an economic model. This model was then applied to three EU Member States: Germany, Greece and Sweden. The testing suggests that providing access to regular preventive healthcare for migrants in an irregular situation would be cost-saving for governments. Moreover, as the model only includes costs incurred by healthcare systems, not costs incurred by the patient or society at large, it is likely that the cost savings are underestimated. This report shows that providing regular preventive care, as opposed to providing only emergency care, is cost-saving for healthcare systems. Even when using a simple model to estimate costs, the implications are clear: treating a condition only when it becomes an emergency not only endangers the health of a patient, but also results in a greater economic burden to health¬care systems. The economic benefits that the migrant population brings to Italy outweigh the costs to the national health system. Centro Studi e Ricerche Idos, a cura di (2018), Dossier Statistico Immigrazione 2018, Roma. Migrants consume a large part of the health budget. This prejudice is linked to other similar ones as, "Many migrants take advantage of health and social resources enabled through our effort of many years", "Too many resources are devoted to the care of immigrants". The system is overloaded, and a large part of the population accuses immigrants of damaging the functioning of the system. However, recent studies show that the immigrant population represents 10% of the population, and their health expenses 0.69% of the total (2.5% of emergency care services), so this discourse is discredited (Miras, 2015; Etxeberria, Murua, Arrieta, Garmendia, & Etxeberria, 2012). ETXEBERRIA, F., MURUA, H., ARRIETA, E., GARMENDIA, J., & ETXEBERRIA, J. (2012). Prejuicios, inmigración y educación. Actitudes del alumnado de secundaria. Revista Interuniversitaria de Formación del Profesorado, 97-131. MIRAS, C. (2015). Prejuicios y racismo en la atención de Enfermería a población inmigrante en España (TFG). UNIVERSIDAD DE JAÉN. Facultad de Ciencias de la Salud, 38. PLAZA DEL PINO, F. (2012). Prejuicios de las enfermeras hacia la población inmigrante: una mirada desde el Sur de España. Scielo, 87-96. Evidence based on compendium of University College London (UCL) -Lancet Commission on Migration and Health. The Commissioners have reviewed a mass of data collected by researchers from around the world. These data describe the scale and nature of migration and the many threats to the health of men and women and their families. This evidence challenges common myths and highlights the diversity, dynamics, and benefits of modern migration and how it relates to population and individual health. The study shows that migrants generally contribute more to the wealth of host societies than they cost.